Here’s one I’ve seen shared in snippets across many different blogs, but I’m not sure if it’s ever been shared in full. Perhaps on some long, distant, since purged blog. I’ve had this kicking around on my shelves for a while now, rescued from a NYC shop otherwise known for techno, house, and hip hop (you never know! ), but I was recently encouraged to take it down and re-rip it, and I’m glad I did, because it’s quickly jumped up the ranks as a autumnal favorite. Besides, the digital copy I DO have has the track names reversed, so this one is worth another look however you want to dice it. 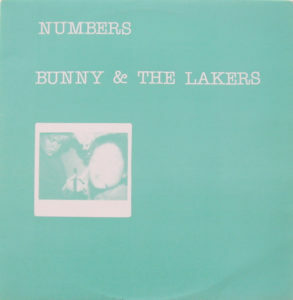 Bunny & the Lakers performed only once, and self-released this album on LP and cassette in 1979. Only 500 records are known to exist, each of them hand-numbered. 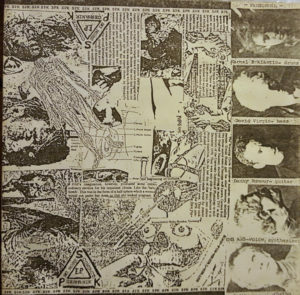 There are QUITE a few sounds explored over the course of this LP, including the krautrock dirges of Faust, pummeling experimental electronics a la Throbbing Gristle, icy piano and synth workouts by way of Telekon, quirky synth punk sounds similarly explored by Tone Set, and even a skittery no wave hybrid thrown in for good measure. The album is wildly experimental and may not be to everyone’s cup of tea, but there’s definitely lots to love here. I especially love the bleak “Weekend Guests,” which features female vocals, primitive electronics, and more gorgeous stream-of consciousness piano ramblings. Closing track “Dolphin Bay” is gorgeous as well… Many of the tracks blend into each other, so I’ve tried my best to separate them. Side B is a bit more structured, but I’m a little unsure where one track ends and the next begins on side A. For your viewing pleasure, here’s the official video for “Nothing To Do With the Dog,” one of the band’s biggest singles and an international breakthrough at the time. Here’s one of two posts lined up to get you through the weekend. 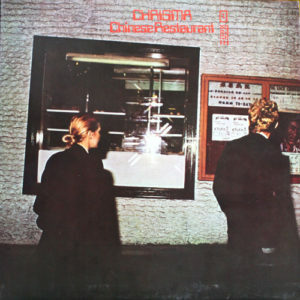 First, we have what I believe to be the complete discography of Italian band Chrisma, a synthpunk outfit active in the late 1970s. 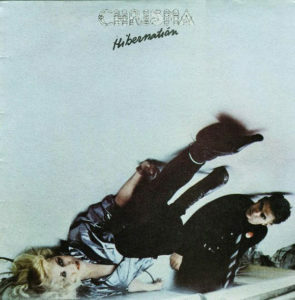 The band combined a Marlene Dietrich kind of vibe with krautrock, Chrome-esque guitar lines, disco rhythms, and primitive synthesizers for a futuristic and incredibly eclectic sound. Very ahead of their time, as far as I’m concerned, especially when you hear the drastic jump in styles between the first 7” and the debut LP. 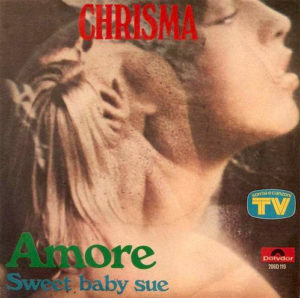 The band takes its name from combining the first names of members Christina Moser and Maurizio Arcieri. 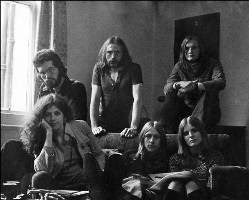 Their earliest recordings were made in Vangelis’ home studio, which more than likely explains their futuristic sound. There’s even a rumor kicking around that Vangelis himself performed on Chinese Restaurant, but he is not listed in the album credits. In case you’re not sold on downloading this discography, peep a performance of “Black Silk Stocking/Lola” here, complete with a latter day interview with the band, for those fluent in Italian. Awesome. If you dig on these records, feel free to purchase the excellent reissues from Medical Records! Hey kids, I’m back! 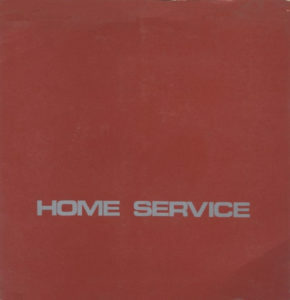 Got a few treats lined up over the next few days, but first we have the entire discography from UK band Home Service. 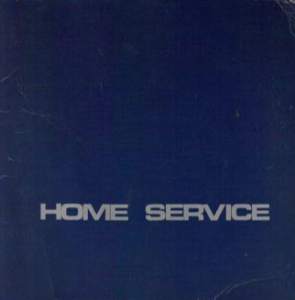 That said, Home Service’s own music was a bit of a curious anomaly in the new wave spectrum. The band mostly toys with a more quirky sound, seen more famously in bands like Units, Tone Set, Silicon Teens, and Devo. Their first two singles were released on Motion’s own Crystal Groove records, while their final 12” was picked up by Situation Two/Beggar’s Banquet. 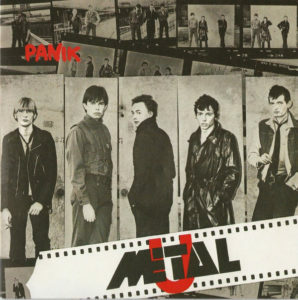 There’s a definite progression in style between the three singles (starting with more guitars and changing over to a mostly synth-based sound), all unified by the band’s unique voice. My favorite tracks across the three are “Wake-Up!,” “The New Age Elite Corps” and “O.M.F.I.L.,” respectively! For curious parties, check out a lengthy interview with David Motion here! 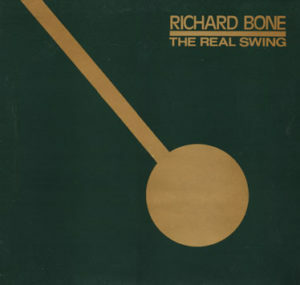 Here’s a classic early Richard Bone 12” for your listening pleasure. Born in 1952, Bone is considered an influential figure in the New York music scene in the early 1980s, a huge pioneer of electronic music. He began exploring the early art of the synthesizer, driven by the works of Brian Eno and Harold Budd, before moving into more poppier territory. 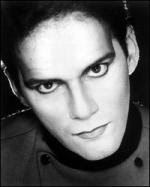 He was also a member of experimental electronic band Shox Lumania in 1981. A good portion of Richard’s early singles were on Survival Records, the same label that brought you Drinking Electricty, Faith Global, Hard Corps, and Play, to name a few. Though he ceased to make pop records as of the 1990s, he still creates ambient music to this day. 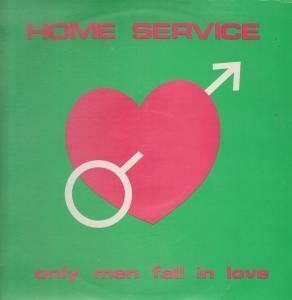 This particular 12” hails from 1984, just a few years into his solo career. Here’s the information. Here’s a little something different for any more open-minded readers of the blog. I’ve flirted with ambient and neofolk-esque material before on these back pages (mainly by way of Les Joyaux de la Princesse), but haven’t develed in completely. But here’s a rare pioneering gem from a band that predates the movement, and serves as a huge inspiration to any future projects, especially Current 93. Comus formed in England, taking their name from both a Greek God and respective John Milton piece. The band received an early boost from David Bowie, who picked the band to open for the singer back in 1969. 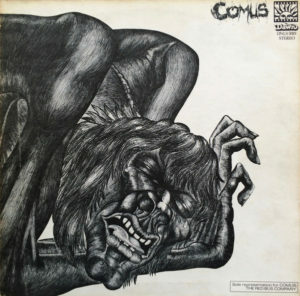 Two years later, the Comus’ debut album, First Utterance appeared. Blending psychedelic music with folk rock, and adding a bit of dark edge, the band has since inspired the likes of Current 93 (who covered the album’s opener and single) as well as a legion of Black Metal bands. Comus released one more record before disbanding. Released three years later, it was a far more commercial, yet still captivating affair. However, the band has since reunited in 2009, and are planning to release a new record as soon as it is completed. With that said, here’s the information for the band’s haunting 1971 debut. A bit of a request for today, ladies and gentlemen, as I’ve uploaded a rather stellar mix of early synthpunk/new/minimal wave tunes. I can’t take credit for creating it, as this mix was originally constructed by Miss Amy Sammartino, a friend of mine from California. It’s both a great introduction to the wonderful synth-based rock world, offering a few choice cuts spanning the late seventies/early eighties. The name derives from the 1966 satircal comedy Lord Love a Duck, the dialogue which is sampled on one of this mixes’ best tracks. Sorry for the delay here, folks…but to make up for it, here’s another one of those 7” grab bag posts, in which i’ve zipped up four singles for your listening pleasure, including one request from an Australian chum. Here’s the information and a quick blurb about each 7”. This is the very first release by Australian industrial collective SPK, and certainly one of their most primitive and direct. 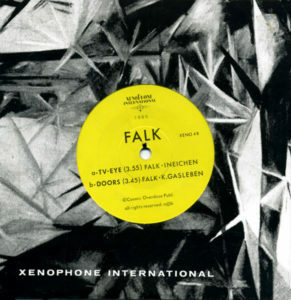 This one was a limited run of 200 copies, and the a-side has yet to appear on a proper CD release, though both ‘Contact’ and ‘Germanik’ are featured on their Auto-Da-Fé LP. 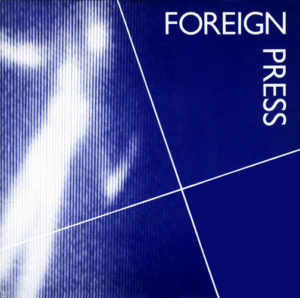 One of the very first synthpunk bands…French origins. 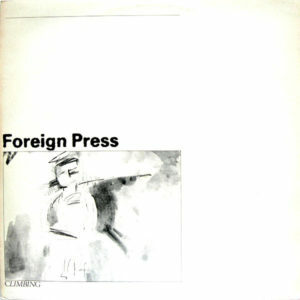 This is their first 7” single, but most of their earlier work has since been collected on the Anarchy In Paris compilation. Lars Falk is one of the ex-contributing members of Swedish coldwave act Twice a Man, who’s previously featured here. Though it shares the name with the Stooges classic, the a-side is an original number. There’s something charming about this otherwise rickety and rough record from this British four piece. 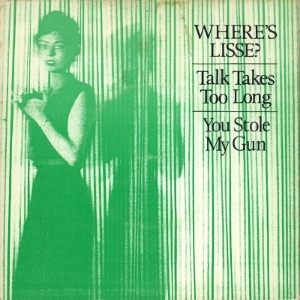 This is one of two releases (they followed this with an equally scarce 12” single), and is chock full of early post-punk energy. EDIT: cover scan provied by Rudeboy Noah! Thanks a ton! 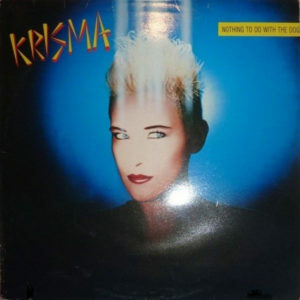 Here’s a request of sorts for a classic minimal synthpop gem. 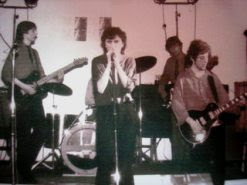 Xex were a more experimental wave band, formed in South River, New Jersey. They were a mysterious affair, releasing one record in 1980 and disappearing soon after. The band “began” as a high school kazoo trio. Member Waw Pierogi’s interest in science led to several unique delay and echo experiments in the early years, most of which were employed on the band’s debut. However, though outfit had little musical technique, their trials and experiments yielded several songs, and after their first performance, the original trio of Waw, Thumbalina Gugielmo, and Alex Zander brought in two of their friends/fans to round out the lineup. Thus, after several experiments and debates, Xex was officially born in 1978. 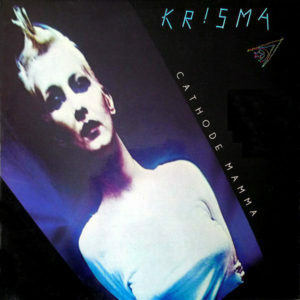 The band spent the next two years constructing several tracks utilizing minimal synth techniques, semi-conventional song structures, and male and female vocal experiments. Due to the nature of their project and the band’s limited abilities, live shows were often inconsistent and humanistic, and often featured performance art and video accompianments. 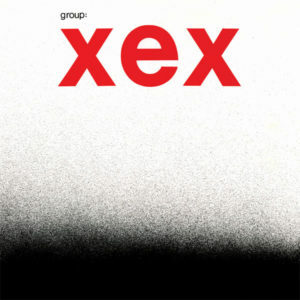 The original pressing of Group:Xex sold little over a thousand copies. Soon after its release, additional members David Anderson and Jon-Boy Diode departed as Xex completed work on a second record, which due to limited funding and a since-deteriorated master tape, has not yet seen the light of day, and may never will. The original trio continued to work together along with new member Cookie Ruggerio (who previous involvement with the band was limited to walking a stuffed cat during a performance of “Kitty”). Only a few tracks have surfaced, and mid 80s performances of the band did not include Waw Pierogi. 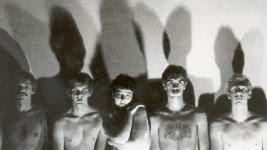 In 2004, cult interest in the band culminated in a proper reissue of Group:Xex, complete with several demo cuts from the band’s original sessions. Just a year before, Alex Zander passed away from a heart attack. Here’s the information for the CD release of Group:Xex. This is one of the few available records I’ve posted as of late, so if you dig on these tracks, be sure to trash these mp3s post-haste and pick yourself up a copy of the cd reissue, which comes complete with extensive liner notes and further information about the band. Click below to order a copy! ATTENTION, dear readers- you can now get a remastered copy of this LP via the always excellent DARK ENTRIES label, an awesome reissue label based out of the west coast. Click here for more info!